Ol Doinyo Lengai, a symmetrical, steep classical stratovolcano rises majestically about 2000m from the East Africal Rift Valley depression to a summit elevation of 2890 m. To the Maassai people, it is home of God, which is also the meaning of the name. Ol Doinyo Lengai is the only active volcano that erupts natrocarbonatite lava. Explosive activity. In addition, at least during the past +-30 years near-continuous effusion and mildly explosive eruption of natrocarbonatite lava from vents inside the crater, sometimes overflowing over the rim, is taking place. The volcano continues to slowly erupt natrocarbonatite lava inside the deep pit crater of the 2007-08 cinder cone which occupies the active northern crater of Lengai volcano. We present a selection of aerial photos taken a few days ago by our friend Gian Schachenmann. Gian Schachenmann, who climbed the volcano recently, did not see major changes since September last year. From the rim, one could hear the slushing of lava inside the crater and big cracks were observed on the NW crater rim near the top, with lots of gasses coming out. Spattering and lava flows of carbonatite lava inside the deep summit crater of Lengai have been recently observed by climbers. The crater which formed during explosive activity in 2008 is gradually being filled by spatter cones and small lava flows. Over the past three weeks, Lengai has quietened down significantly. Observers report a complete pause in activity lasting about two weeks, and then resuming of relatively small ash eruptions. A thermal anomaly is still visibile on satellite date in the crater of the ash cone. The activity at Lengai seems to be increasing. In the past two weeks, explosions have ejected ash plumes rising several kilometers. On 15 Feb., Dutch pilots observed and photographed an eruption plume rising to estimated 12 km (36,000 ft). Based on information from the Tanzania MVO, the Toulouse VAAC reported that Ol Doinyo Lengai erupted on 7 November and remained active. According to Frederick Belton's website, an observer saw a "smoke" plume rise to an altitude of 3.2-3.5 km (10,500-11,500 ft) a.s.l. and drift WSW towards the Gol Mountains on 10 November. New photos from Ol Doinyo Lengai by Tim Leach about three weeks old. Lengai volcano as seen from the north-east on 27 Oct 07: thick plumes of ash rise from the active crater and recent ash and lava deposits can be seen on the flank. As more evidence about the large eruption at Lengai volcano on 4-5 Sep is pieced together, it appears that the eruption was probably a mainly explosive event while evidence of significant lava flows on the flanks becomes less. The observed "lava flows" could have been bush fires ignited by hot ejecta. In any case, there is little doubt that the observed ash cloud was the result of a significant explosive eruption and not just landslides on the steep flank. In the meanwhile, the mountain has calmed down and only weak thermal anomalies are being detected on the summit. It would be imprudent to say that the eruption is over. If this is indeed the start of a major explosive cycle, more eruptions could follow in the next weeks and months. Field investigations are under way. It seems that the eruption at Lengai is indeed a major event and that explosive activity has taken or is taking place in addition to lava flows and probably, bush fires. According to local sources from the nearby Moivaro - Lake Natron Camp, Lengai first erupted at midnight and at 6 am on 4 September. A pilot reported ash rising to 20,000 ft (ca. 6 km). Ashfall was reported from Engaresero Village, but there are no reports on injuries or fatalities. The highly regarded Moivaro Tented Lodge near Lake Natron has been temporarily evacuated. Scientists including Matthieu Kervyn warn to approach the volcano as it could develop into a major explosive, crater-clearing eruption such as in 1966-67. Extremely dangerous pyroclastic flows could be and are likely to be associated if the eruption escalates. 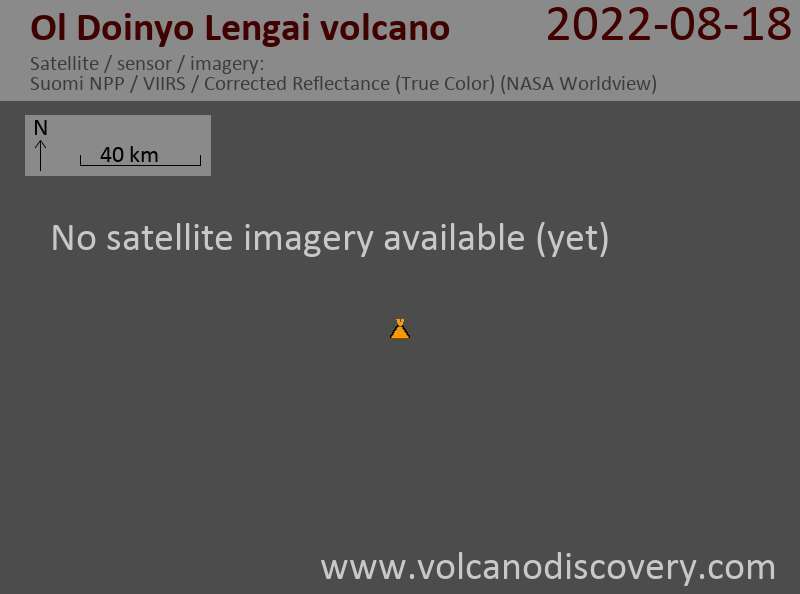 A large eruption seems to be taking place at Lengai volcano, this time for real: On 4 Sept., reports started coming in that a large (natrocarbonatite?) lava flow is descending the West flank. A considerable ash plume was visible on satellite data. Over 30 thermal anomalies have been detected by the MODIS team since August 23 - more than during the large eruption in March 2006. On 4 and 5 Sep, the thermal anomaly at the summit was extremely strong. From this and satellite imaginery, it seems that there was a short overflow to the East and a major overflow to the West starting on September 1st (it could be a bush fire on the volcano flank ignited by lava). New overflows on 5 Sep seem to be taking place on the W and NW flanks. As more news has become available, the news about an effusive flank eruption at Lengai around 15 July turns out to be probably false. The observed "ashcloud" was dust from a landslide. This demonstrates how difficult it is in this area to have robust information. The ongoing seismic activity in the Gregory Rift, however, is quite peculiar. Thomas, our correspondant in Arusha climbed Lengai last week and reports indirect signs of activity near the western rim of the crater, at the place where lava overflowed in the March 2006 eruption. "Hi Tom, Just back from Lengai late last night. It was very cloudy up there…couldn’t see anything. Looks to me like a lot of activity has happened ently. The central crater is growing, and there looks to be lots of recent flow over the western rim where the big eruption spilled in March ’06. The largest hornito on the eastern edge of the central crater is collapsing into the crater. It was too cloudy to get too close, and crevasses in the surface around the central crater looked too daunting to get near. On the very western rim near the place where the lava is spilling over the edge is a new cone. I could hear the lava swishing around inside but couldn’t get close enough to look inside. We sat down on the place where the lava had obviously just flowed a short time ago, and larger rocks on the surface were too hot to touch." Glow from nearby (but hidden) lava pooling somewhere beneath the collapse pit in Lengai's crater (taken on evening of 31 Jan 07). During our latest expedition to the active crater of Lengai volcano from early 31 Jan - 2 February 2007, no eruption of natrocarbonatite lava occured from the summit vents. According to local Maassai guides, the central area of the crater with the large collapse pit near the tall hornito T49b had not seen significant changes since last summer. From an open vent in the NE corner at the bottom of the pit at the base of the hornito, loud washing-machine like sounds of boiling lava was audible all the time. A large pool of lava must be found somewhere at very shallow depths in some caverns beneath that area. This assumption is confirmed by the glow of lava that was clearly visible one night from a second, smaller vent located about 30 m south of the large vent in the base of the collapse pit. One guide confirmed he had seen spattering of lava from this vent some two weeks earlier. In addition to the loud sound of revolving lava underground, a constant, deep rumbling could be heard from the ground, resembling the sounds of very distant thundering. It was strongest in the NW area of the crater between the collapse pit and the fissure vents of the March 2006 lava flow. We think it might be an audible form of volcanic tremor more or less directly related to a magma volume still inside the same dike. When talking to local guides, they believe that a new, large-volume effusive eruption of lava from a similar area as in March 2006 might occur in the near future. A GPS survey and some photographs of the area will be published here in the near future. More detailed information about the recent activity at Lengai has emerged: there was probably no explosive eruption as reported earlier, but one or two very large effusive paroxysms: the first eruption occurred on 29 March, the second probably on 3 April. The eruptions produced large-volume natrocarbonatite lava flows that overflowed the crater to the West near the climbing route, travelled for more than 1 km length through a small canyon before stopping less than two km from a Maassai village at the base of the mountain. Buring vegetation ignited by the lava might have produced smoke that had been mistaken for ash. No evacuations have taken place and no one has left the area, different from early news reports. A good collection of reports and photos about the eruption can be found at Fred Belton's website. The activity at Lengai volcano, that started around 30 March is still enigmatic. According to information compiled by our colleague Fred Belton, a lava flow and lava fountains were emitted on the 30th, but there were no ash emissions. A steam plume was visible that may have been mistakenly described as ash in news reports. According to an observer in Tanzania, on 4 April a very large lava flow was visible on the volcano's W flank. The lava flow was over 1 km long and had traveled down the flank of the volcano and into a gorge. There were no signs that the flow was still hot. Photographs revealed that another lava flow may have traveled W of the volcano on 3 or 4 April. On 7or 8 April, active lava was contained within a new lava lake (?) at the summit. There are contradictory reports about evacuations evacuations from villages near the volcano. Hundreds of villagers living around Mount Oldonyo Lengai in Ngorongoro District have been forced to flee their homes after the volcano erupted on Thursday. Eyewitnesses said they heard a rumbling noise before the volcano began discharging ash and lava, prompting local residents to flee the area in their hundreds. District officials estimated that about 3,000 people from Nayobi, Magadini, Engaruka, Malambo, Ngaresero, Gelai Bomba and Kitumbeine villages left their homes within a few hours of the eruption, adding that most of them trekked to villages in neighbouring districts. Ngaresero resident Ibrahim ole Sakay said alarm bells were sounded after smoke was seen coming from the peak of the mountain, adding that people panicked after lava began pouring out of the volcano.